Update - now Saturday too! 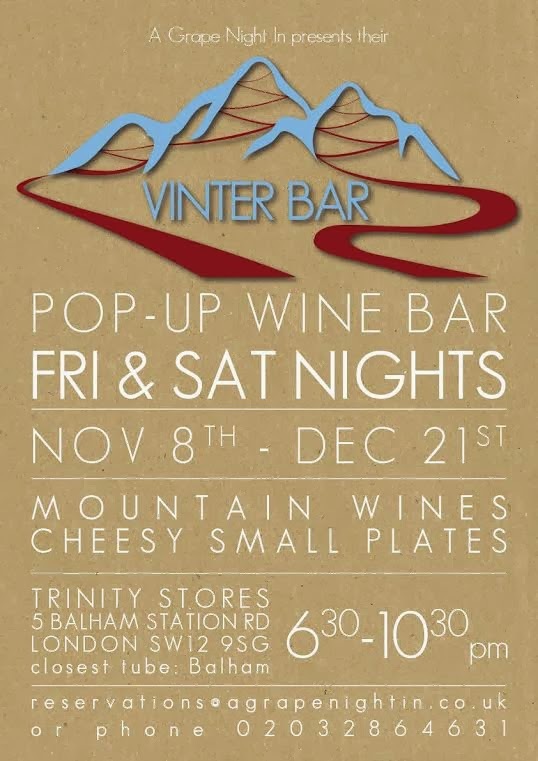 A Grape Night In, currently hosting 'Toast and Roast' Sunday lunches near London Fields, will be hosting a pop-up wine bar, Vinter Bar, at the Trinity Stores cafe in Balham for every Friday & Saturday night between 8th November and Christmas. Expect lots of interesting wines, plus small plates, and a warm atmosphere. "Not content with serving up Toast & Roast on Sundays in Hackney, the girls from A Grape Night In are back in south London with a pop-up wine bar especially tailored for the prevailing chilly nights. 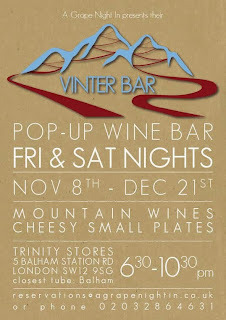 Laura & Kiki would like to welcome you to their Vinter Bar, an alpine inspired pop-up wine bar for the cooler months in the heart of Balham. Every Friday night from 8th November until 20th December, the Vinter Bar will serve up a vinous selection of alpine whites and warming reds; vigorously selected from the coolest climates, the snowiest slopes & the highest altitudes. Expect wines from the likes of Kremstal in Austria, Val d'Aosta in Italy and Mendoza in Argentina, and of course there will be mulled wine! Whilst on the food front, hot from the oven will be comforting 'cheesy favourites such as homemade Montgomery's cheddar straws, gooey Comte mac n'cheese & fondue-like Baked Tunworth with walnut bread. just moments from Balham Underground Station. With prices starting from just £4 for a glass of wine and £3 for small plates, this is the perfect pre-Christmas catch up with friends, or simply a warming apres work drink. Simply drop by or book a table to guarantee your spot (phone or email below). Open from 6:30 to 10:30pm."